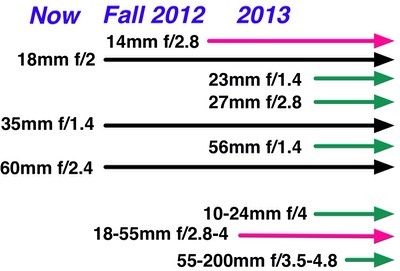 Fujifilm presented an updated XF lens roadmap in a Webwire press release (I've now changed items on the Fujifilm lens page on this site). Some small details changed on a few of the lenses. 14mm f/2.8 (21mm equivalent). A bit smaller than the current 18mm, so comfortably small. 18-55mm f/2.8-4 OIS (27-84mm equivalent). 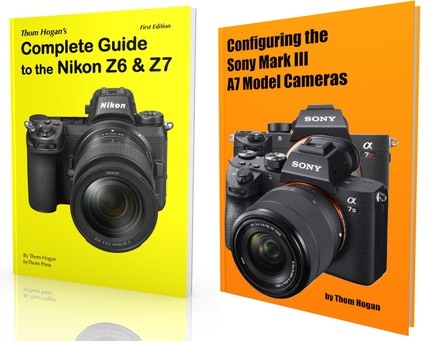 The f/2.8 at the wide end is a change from previously leaked plans. 23mm f/1.4 (35mm equivalent). It appears Fujifilm wants to round out a fast 35/50/85 cycle. 27mm f/2.8 (41mm equivalent). This pancake-style lens becomes the new small normal, and I believe it fully clears the optical viewfinder, as well (many of the larger lenses block a portion of the optical viewfinder, especially with lens hoods on). 55-200mm f/3.5-4.8 OIS (83-300mm equivalent). The ubiquitous consumer telephoto zoom. The variable aperture bit is new. 10-24mm f/4 OIS (15-36mm equivalent). A wide angle zoom, also expected to be rather large in size (as big as the other zooms, at least). 56mm f/1.4 (84mm equivalent). The final piece of the fast 35/50/85 cycle. The primes all make a lot of sense to me; they fill gaps and extend the capabilities that the typical Leica-style X-Pro1 shooter would want. The zooms present a different story. It's been long rumored that Fujifilm will have a more consumerish version of the X-Pro1 (call it the X-Con1 for sake of argument). Replace the complicated hybrid viewfinder with a straight EVF, add a built-in flash in the freed up space, make a few other simplifications and cost cutting changes and voila, you have X-Con1. When and whether we'll actually see that camera is another story, but I think it's a reasonably safe bet. Fujifilm needs to anchor the mirrorless X series with more than a single body choice, and preferably with something that comes in at a lower price. An X-Con1 with 18-55mm kit lens might be that product.